Quick: How long has it been since you thoroughly reviewed your joint use contracts? I'm talking about the joint use agreements you have (for good or ill) with all the owners and attachers for the field assets you own. Last week, right? Good for you, then. Or maybe it's been months or years? Perhaps decades? Oh no. 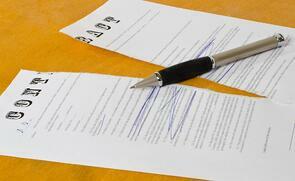 In our experience, it is not uncommon to see contracts sit unexamined for years on end. In the world of field asset management, particularly joint use, there is always something seemingly more pressing to attend to --especially those shiny revenue-generating opportunities (rather than day-to-day business grind for assets you already own and now have to...ugh, maintain.) I get it. The thing is...identifying any contract gaps that may exist is more than worth the time and effort. It's one of those less-than-glamorous things that everyone puts off, but is truly a benefit in the end. Why? Contract gaps can cost your company real dollars. Organizations regularly miss out on revenue for permit to attach fees and rentals when agreements lapse and remain un-reviewed. Bad news. An out-of-this-world opportunity — lost. Everyone remembers the lovable alien, E.T. Most also remember that his favorite food was Reese's Pieces. It could have been M&Ms. During production of the blockbuster movie, Amblin Productions approached Mars, Inc.—M&M's owner—about a tie-in between the movie and the candy. For whatever reason, it appears that Mars declined, giving Hershey's (owner of Reese's Pieces) the chance to capitalize on the opportunity. Epic, revenue-boosting opportunities are often missed - at immeasurable cost. Edwin Drake gave away ideas and lost a fortune. In 1858, reserves of oil under the ground and sea were known to exist, but an effective way to extract them was not. Edwin Drake had an idea, and with the help of a local blacksmith he built the first oil derrick out of pine. He drilled for weeks until hitting black gold. Unfortunately, hard times hit Mr. Drake soon after—he was fired by his partner, lost his money on Wall Street, and neglected to patent his invention, leaving more shrewd businessmen to build their empires on the back of his ingenuity. He eventually earned some sympathy pay from Pennsylvania oil barons, but only a few years before his death in 1880—too little, too late. What place would Drake hold in history if he had made it a point to capitalize on his own assets? Blockbuster could have been Netflix. That headline is not deceiving. Blockbuster literally could have been Netflix: The company considered buying the fledgling video streaming service in 2000, but opted not to purchase. Sadly, it was not the last time the video store giant opted to ignore its fast-growing online rival. Years later, as physical video stores suffered and streaming video became the standard, Blockbuster refused to shift its operating model with the times, deciding entirely too late to add an online option. In two years, the big blue and yellow stores would close forever. What might video rental look like now if Blockbuster had not turned a blind eye to a potentially profitable partnership? Reviewing joint use contracts is simply a part of good field asset management—and a bit like finding change in the seat cushions of your couch, only more like finding mountains of change. What revenue could you find in the "gaps" that may exist in your joint use contracts? It is certainly worth the hunt to find out.